Note: The choker pictured is no longer available. We recommend the Lace Choker, as a close substitute to achieve this look. Great service and fast delivery time. I was very pleased with the authenticity and quality of the materials and craftsmanship. The items fit great and look great, eliciting raves from my friends and associates. 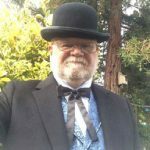 I'm wearing the outfit tonight at a 'Gold Rush' themed party in Sacramento. Thanks!